Advantame is a new high-intensity sweetener that the FDA has deemed safe to be used as a tabletop sweetener and a flavor enhancer in food (except for meat and poultry). It’s made by Ajinomoto, a manufacturer of food additives, including MSG. Interestingly, advantame has also been approved as an artificial flavor. Advantame is a water-soluble, crystalline white powder made from aspartame and vanillin, which is basically an artificial version of vanilla extract. 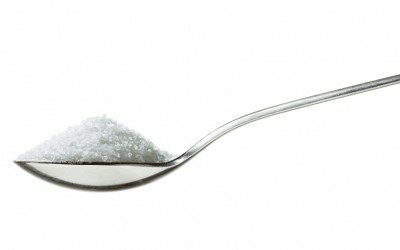 This new sweetener is extremely sweet: about 20,000 times sweeter than sugar and 100 times sweeter than aspartame (and you thought Equal was sweet!). Because advantame is heat stable, it can be used in cooking and baking. It contains no calories or carbs and supposedly has a clean, sugar-like taste with no aftertaste. The manufacturer’s intent is that advantame will be used to partly replace sugar, high-fructose corn syrup, and other nonnutritive sweeteners in foods and beverages. Of note, advantame has also been approved for use in Europe, Australia, and New Zealand, and Japan. What are the concerns about consuming advantame? According to the FDA, advantame is safe for human consumption, as evidenced by 37 animal and human studies. These studies were designed to look at possible reproductive, cancer-causing ,and neurological side effects. Not surprisingly, the Center for Science in the Public Interest (CSPI), who has commented on all of the nonnutritive sweeteners, raised an objection about advantame being declared safe. CSPI sent a letter to the FDA in June of 2014 (one month after advantame was approved), declaring that two of the key studies used to assess safety were “significantly flawed and provide an inadequate basis for ensuring safe use of the ingredient.” In particular, CSPI voiced concern about one study in which a significant number of mice died after being given advantame. They also mention that the FDA’s own biostatistician had expressed concern about this, raising the issue that the death of the mice compromised the study’s ability to determine if advantame could cause late-developing tumors. CSPI also claims that a study involving rats was compromised because weaker and abnormal rats were excluded from the study, leading to biased outcomes. Nonetheless, advantame has been approved. It’s important to point out that advantame is made with aspartame, a sweetener that must be avoided by those who have phenylketonuria (PKU), a rare genetic disorder. However, because advantame is so sweet and therefore only small amounts are needed to provide sweetness, the FDA claims that no warning label for people with PKU is necessary on this product. How much advantame is safe to use? The ADI (acceptable daily intake of advantame is 32.8 mg/kg body weight per day. To give you some perspective, you would have to consume 4,920 packets of an advantame tabletop sweetener to reach that amount. Given that, perhaps this sweetener really does have some merit and will prove to be highly popular. We’ll have to wait and see. No doubt, we’ll see other nonnutritive sweeteners on the market in the future. It’s always good to have choices, but on the other hand, there seems to be an underlying issue of safety. And as time goes on, more issues regarding the impact of these sweeteners on health are likely to surface, as well, including the ongoing debate as to whether they really do affect appetite and body weight. For now, stay informed and choose a sweetener that you feel is best suited to you. Blame can be one of the biggest stumbling blocks you encounter in living with diabetes. Bookmark DiabetesSelfManagement.com and tune in tomorrow to learn how to move past it from Type 2 diabetes veteran Martha Zimmer.